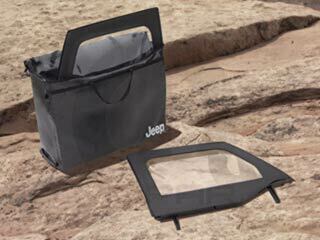 When you take off your Jeep's windows, don't let anything happen to them; keep them safe in a Mopar Freedom Top storage bag or a Jeep Wrangler window storage bag. At JustforJeeps.com, we carry three types of soft window storage: hardtop removable Freedom Top panel storage, two-door soft window storage, and four-door soft window storage. 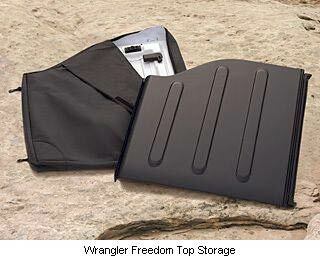 Each is a black vinyl bag featuring the Jeep logo and can keep your windows organized and safe. 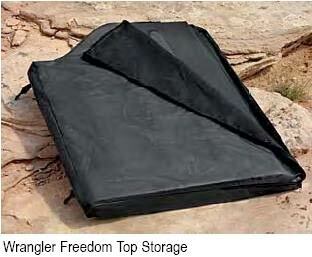 Hardtop Removable Freedom Top panels storage bag with 2 compartments. This bag helps to protect the panels, fits behind the rear seat with headrest attachments, and is recommended for use with the tire mounted carrier. 2 Door Soft window storage bag. Black Vinyl with Jeep logo. 5 Compartment. Stores Quarter, rear soft windows and Front Upper 1/2 doors. 2011-2018 Tailgate window will not fit in this bag. 4 Door Soft window storage bag. Black Vinyl with Jeep logo. Stores Quarter and rear soft windows. 2011-2018 Tailgate window will not fit in this bag. Half Door Window Storage Bag - Black vinyl with Jeep logo. 4 Compartment. This bag stores the 4 upper 1/2 doors. Use with 82210326 to store all 4 Door Windows. Easily used to keep windows protected. My windows on my 1st Jeep were 13 years old. The window storage bag kept them scratch free. Must use!